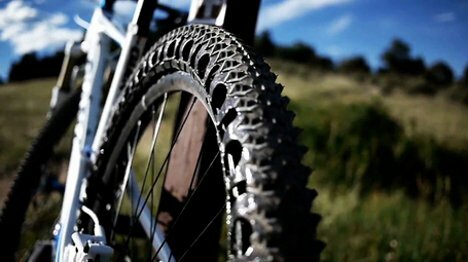 Getting a flat tire while you’re riding your bike is not only annoying – it can be dangerous. What if there were a tire that could eliminate the need to ever deal with this problem again? The Energy Return Wheel (ERW) would do exactly that, eliminating the air from the tire to make it perform better. The ERW is far from a new concept, but the last time we saw a demonstration it was only being developed for cars. 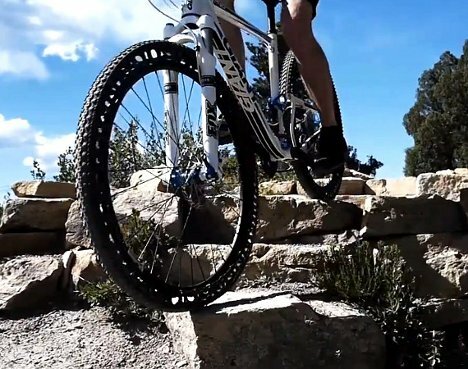 The mountain bike version features an internal layer of rubber which is held in place by adjustable rods. Between the internal layer and the exterior rubber tread, a series of bouncy elastic cushions takes the place of the layer of air present in traditional tires. According to the ERW’s creator, as the interior layer is compressed by bumps and obstacles in the road, the energy from these little actions is turned into forward momentum. That means that a bumpy road actually makes it easier for the rider to keep the bike moving. 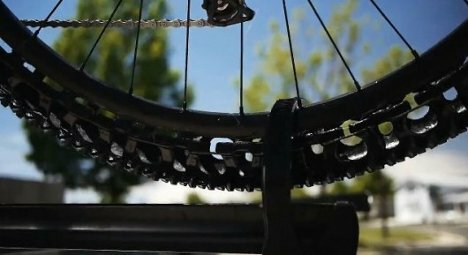 At the time, the bike version of the ERW has open sides – but when they are available for purchase they will feature sidewalls to keep mud and other debris from gathering in the wheels’ elastic cushion spaces. See more in Bikes & Cycles or under Transportation. November, 2012.